The heart that is able to partake of the distress of another, cannot wilfully give it. 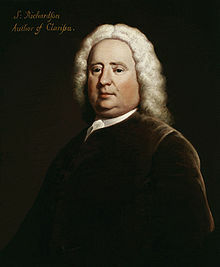 Samuel Richardson (August 19 1689 – July 4 1761) was an 18th-century English writer and printer. He was one of the most admired fiction-writers of his day, both in his native England and across Europe. He is now considered one of the fathers of the novel. Quotations are cited from the Oxford World’s Classics edition (2001). ISBN 0192829602. Vol. 1, p. 5; Preface. Vol. 2, p. 452; Letter 126. Quotations are taken from the first edition. All quotes are from the public domain text, available at "The Correspondence of Samuel Richardson. Vol. 6"
Erskine: "Surely, Sir, Richardson is very tedious." Johnson: "Why, Sir, if you were to read Richardson for the story, your impatience would be so much fretted that you would hang yourself. But you must read him for the sentiment, and consider the story as only giving occasion to the sentiment." James Boswell, The Life of Samuel Johnson, LL.D. (1791), p. 65. Sir, there is more knowledge of the heart in one letter of Richardson's, than in all Tom Jones. Samuel Johnson, reported in James Boswell, The Life of Samuel Johnson, LL.D. (1791) under date April 6, 1772. When his story of Pamela first came out, some extracts got into the public papers, and used by that means to find their way down as far as Preston in Lancashire, where my aunt who told me the story then resided. One morning as she rose, the bells were set singing and the flag was observed to fly from the great steeple. She rang her bell and inquired the reason of these rejoicings, when her maid came in bursting with joy, and said, "Why, madam, poor Pamela's married at last; the news came down to us in this morning's paper." Hester Lynch Thrale (ed. Katherine C Balderston), Thraliana (1942), Vol. 1, p. 145.